If you live and/or own a home in Birmingham, and are looking to remodel your kitchen then you are in the perfect place. 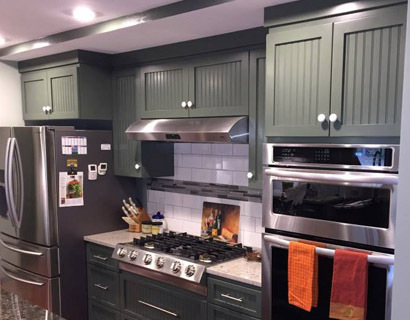 Our highly skilled team of kitchen remodeling craftsmen will deliver the kitchen that you desire and have always wanted, no matter what area of Birmingham you live in. RTS offers you the most... the most kitchen solutions, the best project management and more personal attention than the rest. Our passion is creating kitchens for our customers that enhance your lifestyle with the highest quality products. We provide kitchen design services, custom kitchen cabinets, a variety of counters, hardware, tile, lighting and plumbing fixtures. We have well over 30 years of experience with helping homeowners bring their kitchen remodeling ideas to reality. We can outfit your kitchen with a complete new look. Whatever you envision, we can bring it to life. We can outfit your kitchen with custom kitchen cabinets, or transform your bathroom into a tranquil and relaxing get away inside your house. Our kitchens are exceptional because they are reflections of our clients wants and needs. We personally handle all of the aspects of your project. RTS Construction is a leading Birmingham area gneneral contractor. With over 3 decades of experience, we are committed to the highest quality construction with all of our projects.